The official Facebook client for Windows is a useful tool for accessing your Facebook account from a Windows 8 or Windows 10 desktop without having to login the the Facebook web site. The application includes many of the same features users should expect while using the web site or Android applications including access to messaging, participation in Facebook groups, following friends and discussions along with support for watching Facebook videos. As with the Facebook web site, this Facebook client also provides for notifications of comments, friends' actions and responses to your posts. 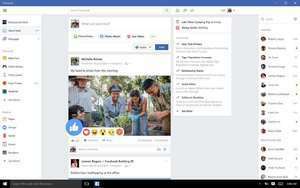 Overall, Facebook for Windows is an alternative way to use Facebook without messing around with browser windows. Version 186.2191.46880.0 is a freeware program which does not have restrictions and it's free so it doesn't cost anything. For security reasons, you should also check out the Facebook download at LO4D.com which includes virus and malware tests. Additional screenshots of this application download may be available, too.